Sprout’s platform enables teams to better collaborate and more easily manage their workflow. We’ve recently released many enhancements to further refine user roles within your team and configure profile and admin settings to maximize productivity and value from the platform. Whether you are managing a team of two or dozens, Sprout’s collaboration tools ensure that teams are set up for success within the platform by offering a broad range of functionality that can be utilized across different teams and departments. Sprout now has a new user permission setting called Can Reply. Can Reply enables users to reply to messages in the Smart Inbox while still requiring them to submit messages for approval in Compose. By safeguarding which types of messages users can publish, Can Reply fills a gap between the Needs Approval and Publishing permissions. Utilizing this new permission, customer service teams can now react to any needs and requests that come through in the Smart Inbox, while brand and content teams can work proactively in Compose without having to worry about a message getting published from anyone outside of their team. These collaboration tools help teams seamlessly resolve support issues, nurture prospective leads and deliver an exceptional brand experience. Learn more about how to apply the Can Reply permission. Sprout users can now send report PDFs for direct delivery to any email address. This is the first in a series of features that provide more robust functionality around Sprout’s report delivery offering. In this first update, Send PDF enables users to quickly email PDFs to stakeholders directly from the Export menu in any report. Users can easily share reports with colleagues or stakeholders that don’t have a Sprout license, making Sprout’s reports available to team members outside of Sprout in a PDF format whenever they need to view them. Learn more on how to utilize this reporting feature. 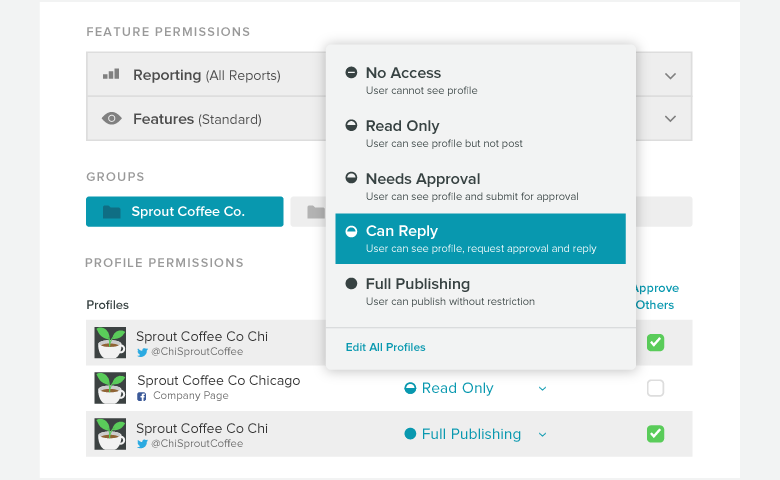 A simple addition to the Company Permissions options in the Users & Social Profiles screen opens up greater opportunity for collaborative team publishing within the Sprout Queue. Now, users with Manage Profiles & Permissions access in Sprout can authorize users on their team to Manage Queue Settings. Previously, only Account Owners had the ability to manage these settings. Keeping in mind that many teams are distributed around the world, it’s important to note that Queue managers will see Queue times in their respective timezones. Learn more here. Sprout users on the Advanced plan now have access to a new settings screen called Customer Care Settings. From this screen, users with Manage Profiles & Permissions can configure their Twitter profiles to Receive DMs from Anyone. In addition, this is where users can set up Twitter Customer Feedback: an advanced customer care tool that leverages Direct Messages as a channel to gather direct feedback from customers after a service interaction. Sprout users can now configure push notifications on iOS and Android for all Facebook message types supported in the Smart Inbox, including: Comments and Replies, Private Messages, Posts and Reviews. For Instagram, users can now configure Comments and location Brand Keywords as push notifications as well. Mobile users can configure push notifications for each individual message type providing the flexibility to enable/disable notifications based on what’s most important to them. To learn more about these features, check out the official release. Sprout’s goal is to consistently deliver new features across all aspects of our product, to help teams work together more efficiently. We make it a priority to listen to our customer’s feedback and constantly evolve our offering. Stay tuned for more updates across our product areas in Sprout Social, and as always reach out with any questions!